The United Nation’s most powerful, non-military response to global threats and security breaches remains, despite critics, skeptics, and procrastinators, its sanctions system. Even after the termination of the Liberia and Ivory Coast regimes, there are currently fourteen sanctions cases, in addition to the hybrid regime on Iran, against national and international wars, atrocities, terrorism, and the proliferation of weapons of mass destruction. The one single insight on which most can agree is that sanctions are a very prominent aspect of the work of the Security Council. Most other issues however have been for many years misunderstood, misinterpreted, and in general, UN sanctions are poorly implemented. Realizing the strong demand for information, innovation, and guidance on implementation procedures, Australia, Finland, Germany, Greece, and Sweden initiated a consultative process in 2013 to focus on potential enhancements of a broad range of sanctions implementation aspects. The concept to what would become known as the High Level Review of UN Sanctions (HLR) had been drafted by Compliance and Capacity Skills International (CCSI) and the Watson Institute for International and Public Affairs. These two organizations would also serve as project managers within the framework of the dozens of HLR consultation meetings held in 2014 and 2015. Building on the previous UN sanctions reforms of Interlaken, Bonn-Berlin, Stockholm, and Greek Processes, the HLR’s three working groups focused on identifying improvements to internal mechanics of the sanctions system. The evolving practices of traditional sanctions actors—member states, sanctions committees and their expert groups, and related international organizations—had been neglected for many years. The conceptualization of the HLR started with the widely expressed unhappiness about the complexities and lack of transparency of the UN sanctions system that in part was blamed for poor political will and often less-than-expected implementation efforts by UN actors. Another surprising insight was how much the sanctions system has expanded without the recognition by the main actors of how these changes impact on the application of sanctions. For example, when, on request of the then-Deputy Secretary-General Jan Eliasson, an Interagency Working Group on Sanctions was created in support of the HLR, the participating 20 UN agencies and offices found that “an internal UN system policy discussion on sanctions [was] long overdue.” A systematic review of UN and external organizations, legal instruments, and stakeholders called on by the Security Council to contribute to the implementation of sanctions revealed a very significant networking effect with related political and law-enforcement efforts (see Table 1). The sponsors of the HLR released in November 2015 a summary of the findings of the review. Known as the Compendium (also released as an official UN document), perhaps its most valuable contribution was the inclusion of 150 recommendations for enhancements to a wide range of implementation practices. Even before it was published, delegations participating in the drafting of new sanctions resolutions began to draw on the insights and innovations generated during the thematic consultations. Their new sanctions language took account of the supporting ecosystem of organizations, the need for greater transparency and inclusion of states not serving on the Council, and the need to more thoroughly brief all UN stakeholders on the nature and purposes of sanctions. With the publication of the Compendium, many states believed that the HLR should not be terminated, that further exploration of practical improvements was desirable, and most important, that the catalogue of 150 substantive ideas for enhancements was simply too much to process. One year after the release of the Compendium, and thanks to the continued leadership of Australia, an Assessment of Achievements, Challenges and Opportunities resulting from the review’s recommendations commenced. The assessment offered delegations represented in the Security Council or the General Assembly an opportunity to prioritize which of the issues addressed in the recommendations they wanted to further elaborate. From a series of exploratory roundtables and bilateral meetings with delegations of states, six themes emerged plus a cluster of three new issues concerning de-risking of financial sanctions in regions occupied by negative forces, the proposal by the Non-Aligned Movement to integrate into the UN sanctions system full consideration of all Chapter VI measures before sanctions are applied, and, in light of the killing of two UN sanctions monitoring experts in the Congo, an examination of field security procedures. Manuals for incoming chairs and delegations of sanctions committees. Definitions of texts as well as standards where applicable terms routinely used in sanctions implementation practices. 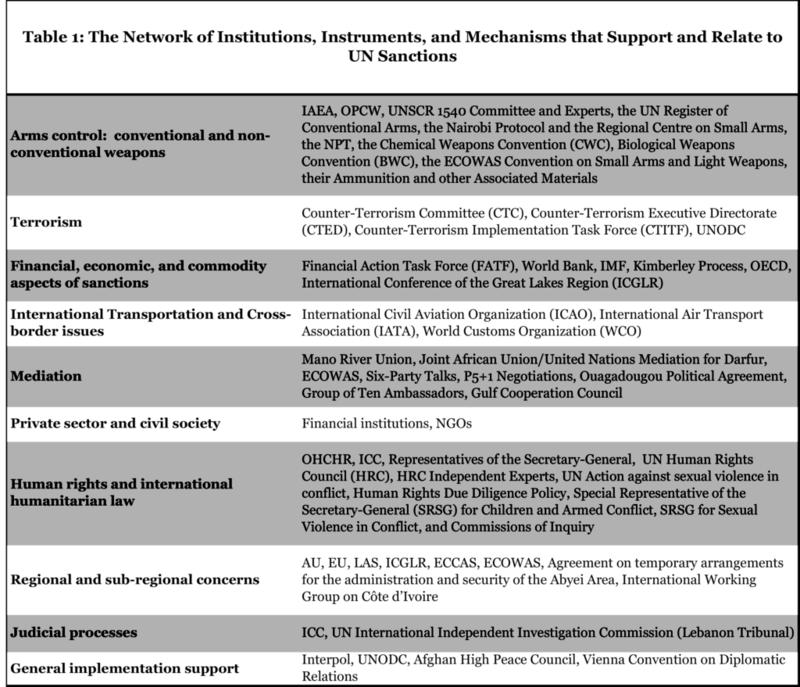 Step-by-step due process obligations of all UN sanctions actors. Priority tasks that enhance collaboration between UN sanctions policy makers and the private sector. Sanctions exemptions and related protocols to facilitate the flow of humanitarian funding into regions dominated by negative actors. A review of the consensus–based decision-making practices of Sanctions Committees to help to streamline their work. Enhanced collaboration, communication and assistance to regional organizations and sanctions-affected states. Convening a High-Level Review style consultation to explore more effective use of Chapter VI measures before sanctions are applied. Develop practical definitions for the duty of care the United Nations and its agencies must have in place as part of the protection of sanctions monitoring experts on field missions. Whether member states will form informal working groups to act on these recommendations remains to be seen. Today’s presentation of the assessment report serves at the same time also as an opportunity for new sponsors and the incoming Security Council member states to engage and help to shape the future of UN sanctions practices. Enrico Carisch is a partner at Compliance and Capacity Skills International, L.L.C.